Moscow, Russia (CNN) -- Five police officers were killed and at least 14 injured Wednesday in the Russian Republic of Dagestan after a suicide bomber detonated himself at a traffic police station, a Russian Emergency Situations Ministry spokesman told CNN. 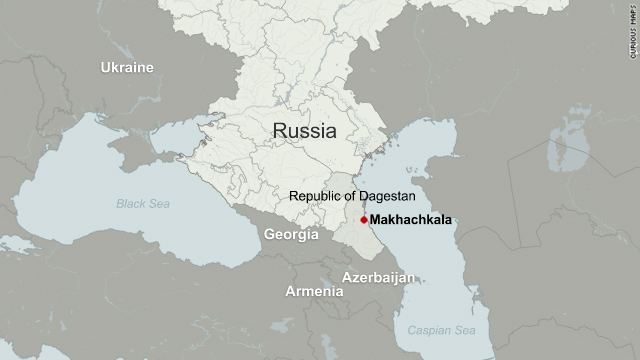 The attack occurred in Makhachkala, Dagestan's capital, around 7:55 a.m. when the suicide bomber drove into the police station compound as officers lined up for roll call, the spokesman said. Before the driver reached the compound's interior, a police vehicle blocked the bomber from driving further, at which point the blast occurred, the spokesman explained. Dagestan is a predominantly Muslim republic in southern Russia where Russian forces have sought to quell Islamist rebels. Russian President Dmitry Medvedev later Wednesday ordered the head of Russia's Federal Security Services to take more control over anti-terrorist measures as separatist violence plagues the Northern Caucasus region. According to Alexander Bastrykin, the head of Russia's Investigative Committee in the Russian Prosecutor General's office, 513 terrorist acts were carried out in the first 10 months of 2009 in the troubled Northern Caucasus. CNN's Ekaterina Abakumova contributed to this story.